There’s all these iconic photos from country music’s Outlaw era that are great to look at and try to transport yourself back to that time to feel the magic that must have been in the air. Headstrong Texans reshaped the music and opened it up to one of the most creative eras in American music history, and what a thrill it would have been to be there. 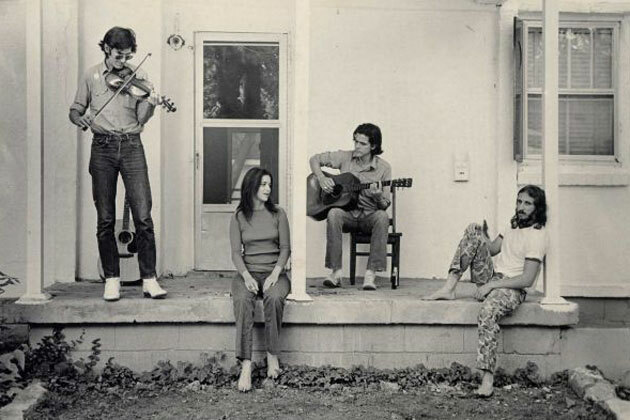 The above photo circa 1972 on Guy Clark’s porch in east Nashville has always been one of my favorites to ogle at and try to imagine being in the audience of this back porch session for the ages. There’s Townes Van Zandt on the left in his white boots playing a fiddle. Who knew Townes even played fiddle? Then there’s Clark’s wife Susanna probably singing lead or harmonies, and Guy himself playing a guitar he probably made or customized himself. But who is the dude with the weird pants and pointy nose sitting to the far right? I’ve asked this question of folks who proclaim themselves experts on Guy Clark and Townes Van Zandt before, but I’ve never received an answer. Is he just some random neighbor or friend who happened to be in the shot, or a lost icon of a by-gone era who could lead to a discovery of new music that just like a cool old photo, could re-connect you to the magic of a past time? That latter point is apparently up for debate, but what isn’t is that if Daniel Antopolosky wasn’t around, there’s a good chance Townes Van Zandt would have died of a heroin overdose way before he was able to pen many of his legendary songs. In the spring of 1972, Antopolosky and Townes Van Zant took off for Houston in Daniel’s white Dodge van. Two days into the trip, Daniel was carrying Van Zandt into the hospital where he was initially declared “dead on arrival” by the medical staff. Townes had slipped into a coma, and eventually they were able to revive him. But according to doctors, if Van Zandt had arrived to the hospital two minutes later than he did, he likely would have died. Daniel Antopolosky was born and raised in Augusta, GA, and attended the University of Georgia in Athens where he began playing music. This is where he met Townes Van Zandt, and accompanied Townes on a six month tour where he sang backup and occasionally performed a song or two himself. Daniel dedicated his life to songwriting, and was right there during one of Townes Van Zandt’s most prolific eras. And ran away he did. After traveling the country and world for a while, Daniel found himself back in Georgia where he met his future wife Sylvia who was a medical student from France. Daniel eventually followed Sylvia back to France, and after all of Daniel’s instruments were stolen in the city, they decided to move to a 30-acre farm outside of Bordeaux. Sylvia’s occupation as a doctor allowed Daniel to stay at home to tend the organic farm, raise chickens, and write songs. But Daniel only wrote songs for himself and his family until he was “discovered” recently, and the idea was hatched to fly Daniel to Nashville to have him cut his first record with big-named producers and a full band, and chronicle it all in a documentary film. Of course coaxing a somewhat reclusive and shy songwriter to cut music in a big studio with a band behind him was not going to be easy, and overriding all of these concerns was the same self doubt that had stimulated Daniel to leave the songwriting scene of the 70’s in the first place. The first attempt to fly Daniel to Nashville to record was delayed because one of Daniel’s beloved chickens had fallen ill—illustrating the set of priorities Daniel has in his simple life on a French farm, well away from the thirst for stardom present in Nashville. However Daniel Antopolsky persevered through the recording process, and is now set to release his debut album at 66-years-old called Sweet Lovin’ Music soon. A documentary of the project called The Sheriff of Mars is also set to be released sometime next year. It’s all reminiscent of Doug Seegers from 2014, who was another previously-known songwriter that disappeared for many years, and then re-emerged to modern acclaim. So the mystery of the man in the funny pants is solved, which is sort of sad because the enigma of the unknown figure in the photograph was something interesting to speculate on. But the story of Daniel Antopolsky remains an interesting case study into fate, and how thin the margins are between fame and being forgotten. Sure, I love the scathing rants, and funny commentary on the state of modern Country Music, but this. This is why I come to this site every day, and read every article you post, Trigger. I may not always comment (I mean, what I can say that will add anything to what so many of the incredibly insightful regular commentors have to say? ), but I read ’em all. This is a fascinating story, and I appreciate you taking the time to dig into the roots and traditions and history of the Music I love so much. I say it almost every time I comment, but it bears repeating: Thank you, Trigger. The work you do here really does make a difference. You’ve summed up my thoughts perfectly, Jaimito. Great article trigg. Very interesting. Damn. This guys has it, what he’s been through, what he’s seen and the rustic nature of his being. He has it. It’s a damn shame he’s been hiding in France for so long. Maybe I missed it but is there a release date for his album? BTW not wanting to cut a verse in his song that’s about his chickens?!?! OUTLAW like I’ve never seen before. Two guns way, way up. Wow… this album may be the most important thing in Country since Don Rich sings George Jones… I agree though, I’d always sort of loved the speculation on that photo. I met a guy who lived in the middle of nowhere rural Michigan, no cable, no internet, heated with wood all year, probably one of the last of his kind… anyway he said he used to hang out with Roy Clark, and he played a bunch of well known songs that he claimed to have written. I had this sort of fairy tale in my head that maybe he’d been the guy in this photo. this reminds me of that iconic jazz photo that the motion picture “the Terminal” was about… I hope his chicken was okay. Wow, what an interesting story! Poncho and Lefty is one of my favorite songs. I love vintage photograph too. Great job. If you can get your hands on “Rain on a Conga Drum” Townes tells a wonderful tale of the lead up to and writing of “Pancho and Lefty” that includes Daniel. Thanks for posting this Trig. This is defiantly on my watch list. It makes you wonder about all the artist during this time that never made it or even played live. Stories like this is what will keep country music alive and keep educating the younger crowd. That picking scene at the end of the trailer is flat out awesome. Great story, thank you. It’s nice to see that Daniel has a wonderful family. He seems to be happy. I’m looking forward to the album and curious to hear if any of the songs of his debut deal with the pain and guilt of losing a good friend. Trigger, now you’ve got me wondering – who took the photograph???? I’m not exactly sure. I’ve tried to find that information as well to no avail. Just found out it was a guy named Al Clayton, mostly known as a food photographer. Thank you for posting this story! If it wasn’t for SCM I probably would never have heard about this. Cool story! Can’t wait to see the documentary! 2 thumbs ups also, Mr. Trigger, very informative article, hell I might even send some paypal, dough, got to ask the boss, I come here 3 to 5 times a day, to get me some “edumaction”. As a fellow Georgian and UGA alum lets just say that’s what we call a DGD…Damn Good Dawg! Trigger, seeing that he is from Augusta, GA, I wonder if he knew or ever wrote with/hung out with the great Larry Jon Wilson? Would be interesting to know. Great article. 2 guns up my friend! Great story. The early days of outlaw Texans. I moved to Nashville in ’91 and a song plugger for one of the hottest publishers on Music Row, befriended me and took me to a party where I saw Townes playing his guitar. Guy Clark’s wife was also there, along with other notable songwriters and Music Row heavies. It was a magical moment listening to Townes sitting there singing one of his songs. Very interesting. Always enjoy music tales, country or not. I am one of the filmmakers of this documentary. I can tell you that the photographer of this photo was a man named Al Clayton. He was a very talented and friendly man. I say was, because sadly he passed away. We hope you’ll all enjoy the film when it’s ready for release! gona miss guy clark and already m iss townes music.